Hot gold, antique gold a prized possession was suddenly found 'hot' enough to make the Geiger Counter Needle jump off the scale..... Redness on the ring finger may turn out to be more serious than a simple sensitivity to jewellery. Man has 32 teeth in his permanent set. Many persons fail to develop one or more of their third molars, thereby causing the numbers of teeth to lie between 28 and 32. A small percentage of persons also fail to develop even that allotted number. A failure of tooth to develop is called anodontia. it may be complete or partial (hypodontia). In the past various studies have been carried out on this subject on different aspects. This study was carried out amongst 48 patients with partial anodontia reporting Govt. Dental College and Hospital, Ahmedabad. Various questions were asked to each patient to evaluate the etiopathology. All the patients were examined in dental OPD to find out other oral, facial or systemic malformation. The cases of partial anodontia without syndrome showed the most commonly missing teeth were maxillary lateral incisors and mandibular central incisors. The most common facial malformation found were depressed bridge of the nose and frontal bossing. The most common oral malformations found were overretained deciduous teeth, peg laterals, impacted teeth, high arched palate and tongue tie. The most common syndrome associated with partial anodontia noted was Hypohidrotic Ectodermal Dysplasia. Amelogenesis Imperfecta is a hereditary condition affecting dental enamel without any systemic manifestation. This condition can be inherited as either Autosomal or X-linked. In this case report, we discuss with the help of Pedigree Analysis, an account of three generations in a family affected by Autosomal Dominant, Hypoplastic type of Amelogenesis Imperfecta. Although two forms of treatment have been presented in this section; this feature does not endorse any one treatment over the other. Decision on the treatments should be case-bound. Information presented here is not intended as specific medical advice and should never be used to replace expert care. Developing teeth have been considered as a good indicator for determination of age of an individual with unknown birth data. The common methods employed have been radiographic subjective assessment of tooth development and subsequent comparisons with dental charts. The accuracy of these methods has been questioned since the distribution around an estimated age has been more than ±2 years between 10th and 90th percentile. 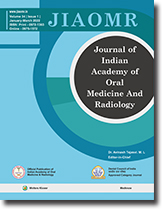 In an attempt to avoid the short coming associated with the subjective methods, a study of objective measurement of root length of mandibular 2nd premolar and permanent 1st molar by intraoral digital radiographic technique was conducted in the age group of 10-14 years and analyzed statistically using stepwise multiple regression models. It is found that the mandibular premolars can be used for age estimation with fair degree of accuracy between the age of 10-14 years. Cancer is a crab like disease where 17.9 million persons of the world are suffering from this disease. In India 16.4/100000 male persons are suffering from Oral Cancer and while for women it is 8.8/100000 person. In urban India Cancer incidence ranges from 106 to 130.4 men/100000, 100 to 140.9/100000 for women. The most important predisposing factors for developing cancer are bidi, chutta smoking, chillum, hookah, betel quid chewing and khaini chewing. Annually about 75000 to 80000 persons develop Oral Cancer (as primary tumor) annually. I have seen that proper supplement of vitamin A, E, C, retenoic acid, selenium, alpha lipoid acid, spirulina, and all the plant antioxidants has tremendous chemopreventive properties to protect the population from Oral Cancer. This article will deals mainly with the protective effect of plant (phytochemicals) and also about flavonoids (obtained from black tea), and theoflavins - as a chemopreventors to Oral Cancer. This is a serious section designed to test your diagnostic skill. Periodically we will bring to you clinical and radiographic pictures for you to test your diagnostic acumen. So remember to come back and see what's new in the Grey Area 's. Oral myiasis is a condition in which the soft tissues of the oral cavity are invaded by the larvae of the flies. It is an infrequently reported disease in man. A rare case of a female patient with draining sinus secondary to root fracture, superimposed with myiasis is reported. Christ Siemen Touraine Syndrome [CST syndrome] more commonly referred to as anhidrotic/hypohidrotic ectodermal dysplasia. It is a hereditary disorder characterized by abnormal development of certain tissues and structures of ectodermal origin. It is diffuse, nonprogressive disease characterized at birth and by involvement of epidermis plus atleast one of appendages (hair, sebaceous glands, nails, teeth or mucous glands). Hypotrichosis, hypodontia, hypohydrosis and occasional onychodysplasia are prominent features. It is an X-linked recessive disorder occurring in its full expression only in males, females as heterozygotes may be mildly affected. A case of 20 year old male with CST syndrome is discussed in this article. Impacted teeth though a fairly common finding is of great diagnostic challenge. It is a known fact that the tooth most frequently impacted is the mandibular third molar. Few other teeth also have the tendency to remain impacted, but least of all the incisors. An unusual case where all the Permanent mandibular anterior teeth are Impacted is reported. Supernumerary tooth is a common dental anomaly present in both maxilla and mandible. It may manifest as an isolated dental anomaly or as a feature of a syndrome. Talon cusp is another dental anomaly and presents as an accessory cusp in both deciduous and permanent dentition. Talon cusp is usually asymptomatic; however, it may present with numerous clinical problems. Talon cusp is clinically manifested in three forms; Talon, Semi-taIon and Trace Talon. Talon cusp, present in a supernumerary tooth is an uncommon dental anomaly. In this article, we present a case report of bifid talon cusp present in a supernumerary tooth along with an overview of classification of talon cusp, different clinical variants, etiopathogenesis, associated syndromes, clinical problems and treatment modalities. Sweet's syndrome, or acute febrile neutrophilic dermatosis, is a condition characterized by the sudden onset of fever, leukocytosis, and tender, erythematous, well-demarcated papules and plaques, which shows dense neutrophilic infiltrates on histologic examination. Although it may occur in the absence of other known disease, Sweet's syndrome is often associated with hematologic disease (including leukemia), and immunologic disease (rheumatoid arthritis, inflammatory bowel disease)and various other conditions In this article, we present a review of this syndrome along with a rare case of sweets syndrome associated with Trigeminal Neuralgia. "It takes intelligence, even brilliance, to condense and focus information into a clear simple presentation that will be read and remembered. Ignorance and arrogance are shown in a crowded, complicated hard-to- read poster" - Mary Helen Briscoe.